Jetsons: The Movie (1990. 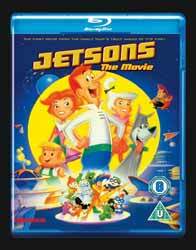 1 hr, 21 min, 59 sec) is an animated film based on the television programme The Jetsons. The film was directed by Joseph Barbera and William Hanna. The film retains the look and feel of the original show with its unrealistic, but distinctive, designs. The story, likewise, retains many of the themes. Their eldest daughter, Judy, is rebellious. Here she is voiced by Tiffany, when she was still popular as a singer, who also contributes three forgettable songs to the affair. Jane is George’s obedient wife and Elory is the only character who is developed from the show as he loses some of his hero worship of George as George becomes consumed by his work. The plot is relatively simple. George is sent to a new sprocket facility by Mr Spacely, he thinks it’s a promotion, but in reality everyone who has been sent there has disappeared so Spacely needs someone uniquely stupid and that would be George. Obviously George goes missing and needs rescuing, along the way it is revealed what happened to everybody else. The film was made in the end of the nineteen eighties, so I’m not quite sure why the print looks so bad. To say that the film's grain was evident would be an understatement. That would be bad enough but the print also shows dirt and artefacts. The combination makes the film difficult to watch and trumps anything good about the affair.